This is well-said for freshers and beginners who would learn an art or skill by experimenting in a laboratory and sometimes on the job while working as an under-study of an experienced employee. This is pretty much the case for a first-time supervisor, a new employee in a white collar job, a new manager. This statement goes out of context if we apply this in a literal sense to the work of a surgeon, a pilot, a soldier, a machine operator, a fireman. We cannot let a surgeon conduct experiments on a patient who needs urgent medical help; similarly, a soldier cannot fiddle with a new equipment or try something new while the enemy is raining fire. Hence, there is no uniform rule about learning from mistakes and eventually reaching the perfect outcome. 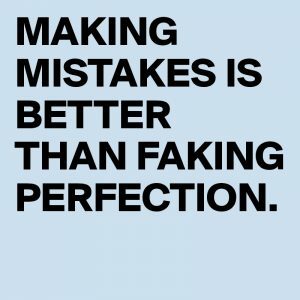 Mistakes tell us what doesn’t work! We have to know when to let people learn on the job, discover what works and what does not; eventually gain insights, innovate and excel. Thomas Edison when questioned on his many failures, he retorted that he hadn’t failed 10,000 times, but succeeded in finding 10,000 methods that wouldn’t work. This speaks a lot about his personal values and beliefs. He is an epitome of optimism and self-confidence, not many people can match his quintessence. Encourage them to step out of the comfort zone! It is important that we build an environment in the organization where people neither burden themselves with fear nor do they abort their imagination, explore stepping out of their comfort zone or try veering into uncharted territories. A leader isn’t a superhuman; he or she has to leverage the potential of the team members. The environment for the team has to encourage trials, tests and experiments to discover better ways of accomplishing the same results, newer ways of delivering better outcome or new outcomes, new products and markets. Again the leaders play an important role in making choices. Considering the fact that resources are limited and costly, they back the projects which are potentially more meaningful than the others in their mind. Leaders might go wrong in making the choices, because they deal with many unknown in the process. However, they need to make those choices and learn in the process. An organization which encourages people to imagine new possibilities and try them out without the fear of being judged, delivers better results than the company which limits its operations to their comfort zones. Leaders have to show the way! We understand, a factory worker cannot afford to deviate from the standard operating protocol, a customer service associate must follow the processes defined by the organization. How can we help them experiment new ways of accomplishing the same results or improve them? Sometimes, they might be able to re-engineer their current methods to eliminate costs and delight customers. Some of the most valuable products, Gmail and Google Maps were developed as a result of the side projects that engineers in Google undertake! So, it’s about the character of the leaders, their beliefs, the environment that they create and the facilitating ecosystem that they build and operate. So, we have to build laboratories, hold brain storming sessions, run competitions to generate enthusiasm, evaluate progress on periodic basis, reward projects and people, and recognize efforts even if the results did not match the plans. Some organizations show their commitment to innovation by announcing a development initiative and allocating a budget with the hope that the team would bring out smarter ways of doing things and hence, improve company performance. However, it doesn’t deliver the desired results. Leaders have to be personally involved right from conceptualising the change, creating bandwidth in the team to try new things, drawing detailed plans, seeing through them and rewarding people, teams and projects based on the efforts rather than focusing on the results alone.